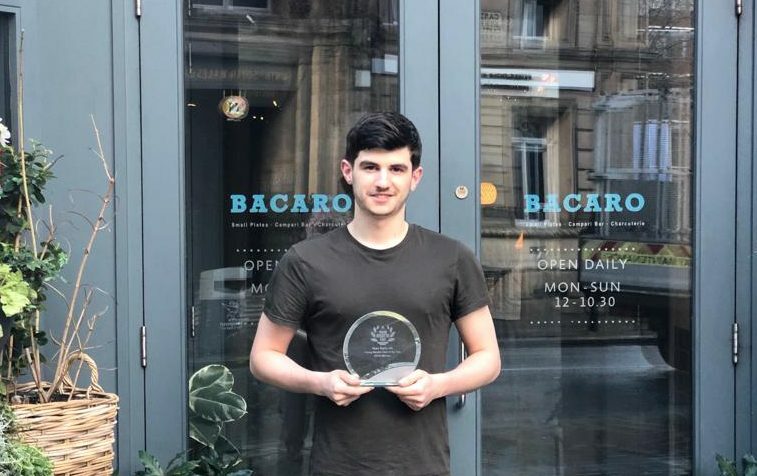 Liverpool restaurant Bacaro on Castle Street is celebrating after chef Andrew Williams won the Gallo 2019 UK Young Risotto Chef award. The competition which features chefs aged from 18-25 years old and at different stages in the culinary career – some still at college while others in a professional and commercial environment. The chosen chefs are invited to London to cook off their entry Risotto dish at Westminster College in a very demanding, high-pressure environment, with the dishes then tasted by an esteemed panel of experienced chefs and experts. Andrew Williams of Bacaro Liverpool developed the winning dish of Primitivo Risotto made with a caramelised onion broth, taleggio cheese, aged parmesan, Valrhona chocolate, toasted pinenuts and finished with white alba truffle and chive oil. Matt Walsh, Group Executive Chef of Red & Blue Restaurants says “We are immensely proud of Andrew and the hard work he has put into this dish. This award is testament to the training and the dishes we are producing in Bacaro and will put us on the culinary map”. Andrew’s winning dish will not only be featured for a week in Gordon Ramsey’s Union Street Cafe, he will also receive an all expenses paid 3-day work experience at Angela Hartnett’s Michelin starred Italian Restaurant, Murano in Mayfair, London.